This morning dawned very early and overcast for the Basics. It's still pretty cloudy as I write this. We had our photographers out to catch the Swearing-In Ceremony, which has now concluded. Most of the photos from yesterday are now up in the In-Processing gallery. To get there you can click on the Classes tab above, select 2021 and then In-Processing. Here is a link to make that easier. INPROCESSING . There will still be a few more to go up as they come in. Also for your viewing pleasure the KAFA Facebook page has a lot of good content, including videos from I-Day. They will also be a good source of coverage during BCT. Here is a Link to their Facebook page. KAFA . KAFA is staffed by cadets and is part of Cadet Wing Media, but the audio and video streaming is paid for by the AOG. So, here is how the day will shape up coverage wise. We will continue to upload the remainder of the photos from I-Day including some parent's picnic photos. With plenty of photos for the first day, that should keep everyone busy playing "Where's Waldo". As the day progreses we'll starting processing and uploading the photos from this morning's activities while also taking more photos this afternoon, which should be processed and uploaded by tonight for your viewing pleasure later this evening or tomorrow depending on where you live . There are a few photos already up in the BCT-1 Gallery from this morning, just to get you started. 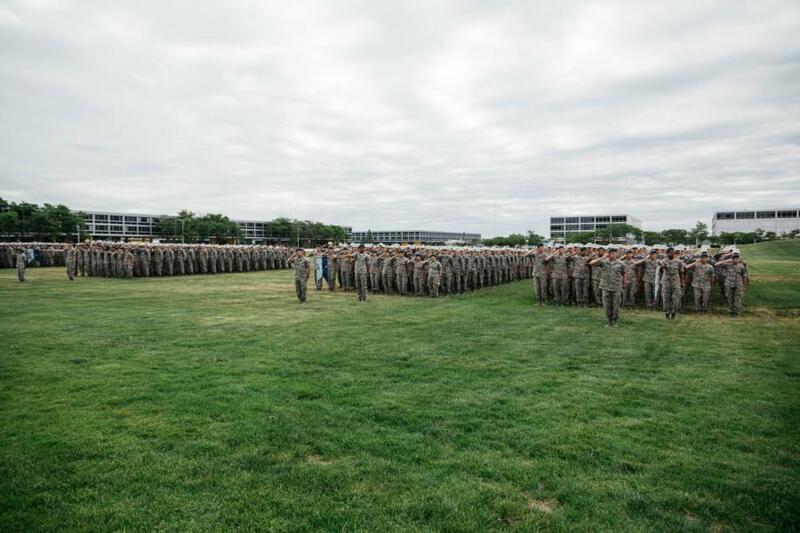 It is an amazing transformation from a gaggle of civilians yesterday to a class formation in uniform this morning. Always amazes me. The swearing in photos will not be separated by squadron, but going forward that should be the exception rather than the norm. More explanation about that below. With that being said, I want to talk again about expectations, since we have many new readers since yesterday. 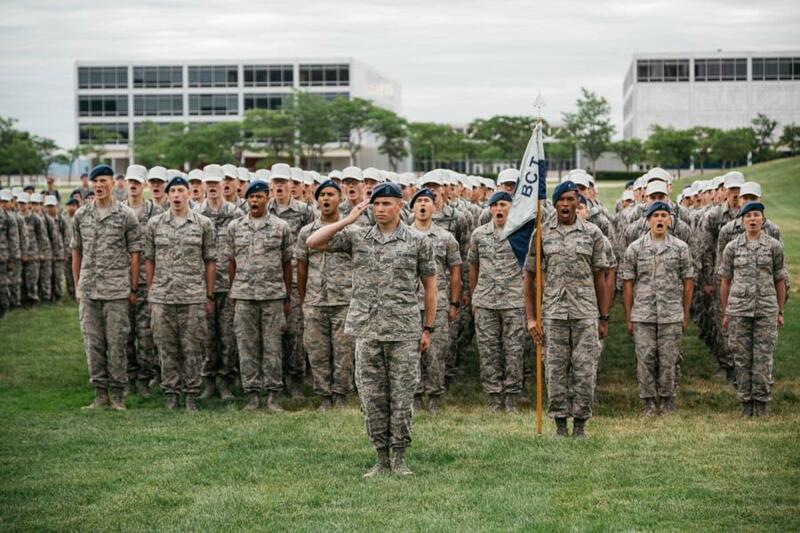 To make things easier in your search for your basic, we have created galleries for each of the eight basic training squadrons. We have divided BCT into three main time periods. In-Processing Day, BCT 1 and BCT 2. Obviously In-Processing was yesterday. Today begins BCT 1. Every photo we take regardless of squadron during BCT 1 & 2 can be found in those main galleries. Where possible, we also put a copy of the photo sorted by squadron into each squadron's gallery (A-H). If you look at the BCT-1 gallery ounder Classes (2021) above you will now see a drop-down menu for each BCT Squadron to make your photo hunt easier. Each squadron is divided into 5 flights that will eventually turn into the academic year squadrons. Here is an example. Using the chart below, Basics in BCT Aggressors, D Flight will be in Cadet Squadron 4 when the academic year begins. When the squadrons are mixed together, like this morning and yesterday during in-processing we just put all the photos into the main gallery. Trying to sort each individual photo would take more manpower than is practical. We will make sure to let you know how best to search in each blog. As I mentioned in an earlier blog, we may not be able to cover each squadron each day. Since each squadron has five flights who train separately, even though we may be covering say Cobras, we may not get every flight, since they don't do things at the same time. Please don't keep score. We have no way to tell which flight is which, only the squadron color. The security access, and the training schedule are the limiting factors. We have worked hard to be sure that by the end of BCT, each squadron has the same level of coverage. So, today, as an example, we are covering all 8 squadrons in the cadet store buying items they will need. That doesn't mean everyone will see their basic, however. You can look for photos in their squadron galleries by tomorrow. Over the holiday weekend the basics are going to be doing a lot of testing in classrooms. We can't cover that, but they will all be doing something we can cover tomorrow and will be doing Intramurals on the 3rd of July. We will be able to have a lot of access and should be able to cover every squadron doing something. I hope that is clear. I will get more into how things will work during BCT 2 and Jack's Valley as we roll along. Lastly, even though I was really specific about what our coverage is today in advance as an example, generally we will be blogging about what has already happened. Since this is the Air Force and things always remain fluid, I don't want to promise coverage that we end up not being able to provide. We'll be back this evening with another blog, until then enjoy the photos, they will be uploading all day.